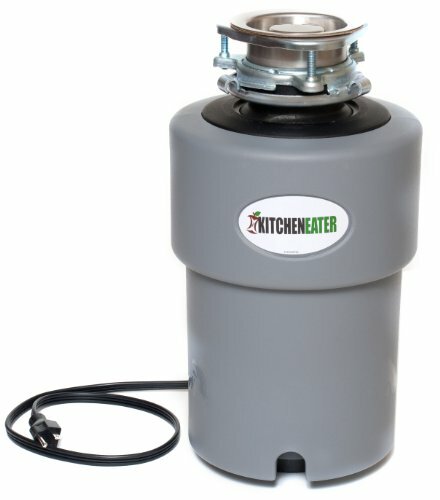 Enjoy efficient, quiet waste disposal in your kitchen with the 1-horsepower KitchenEater food waste disposer, which features a greater grinding capacity thanks to high-speed permanent magnet-powered motors, rust-resistant stainless steel components, and an easily installed mounting system. 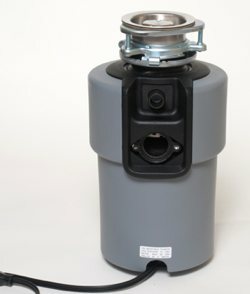 This waste disposer is safe for properly sized septic tanks. The KitchenEater features a snap-and-lock, three-bolt system that mounts securely to the sink. 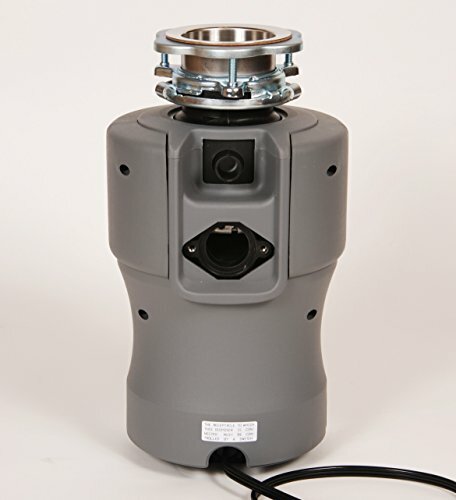 The disposer attaches easily to the mount with a simple quarter turn making installation easy. 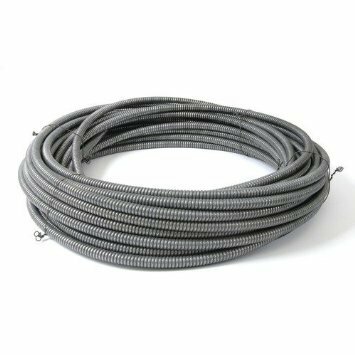 In addition to easy-to-follow assembly instructions, you can also access a toll-free help line for answers to any questions. 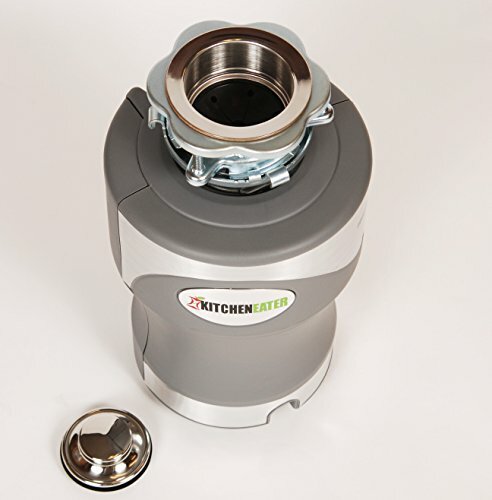 KitchenEater disposers feature a sound barrier and insulation surrounding the grind chamber, making them quieter than most food waste disposers. 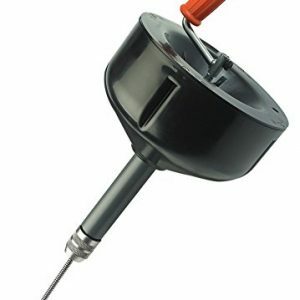 The mounting system and the drain elbow are designed not to vibrate. The high-end KitchenEater disposer is outfitted with an exclusive Micro Blade for greater grinding capacity. 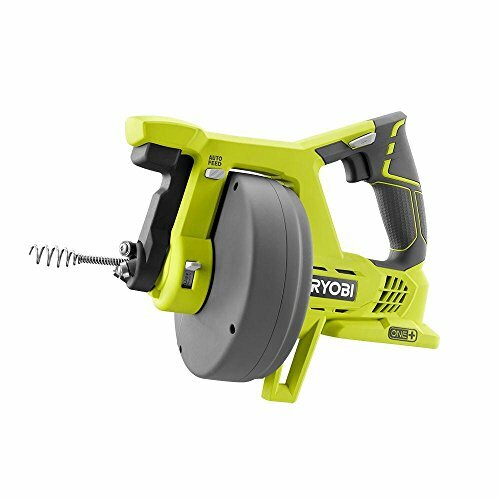 All grinding components are constructed of rust-resistant solid stainless steel, and a high torque motor enables more efficient grinding that prevents jamming. Features: KitchenEater Micro Blade Quieter Sound Technology This 1-horsepower disposer is backed by a lifetime in-home warranty. 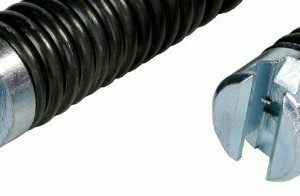 Mounting hardware included Disposer drain elbow with gasket and stainless steel flange Disposer flange and stopper with a polished chrome finish 3-foot three-prong electric cord Rubber sound and splash baffle Installation instructions From the Manufacturer: KitchenEater 1 HP “Snap and Lock” 3 Bolt Mounting System, Stainless Steel Grinding Components, Sound Insulation, Safe for Properly Sized Septic Tanks, High Speed Permanent Magnet Powered Motors. 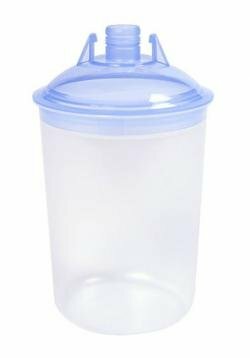 Enjoy efficient, quiet waste disposal in your kitchen with the 1-horsepower KitchenEater KE1PC food waste disposer, which features a greater grinding capacity thanks to high-speed permanent magnet-powered motors, rust-resistant stainless steel components, and an easily installed mounting system. 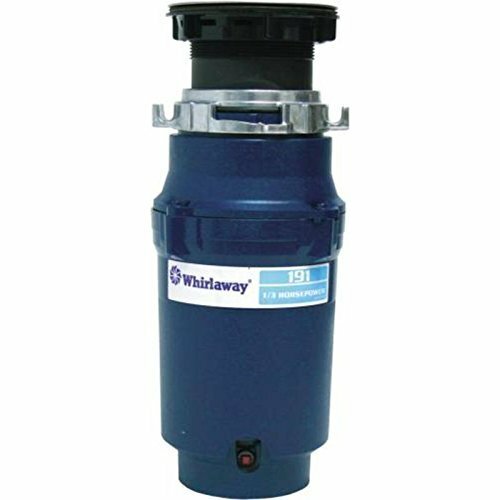 This waste disposer is safe for properly sized septic tanks. 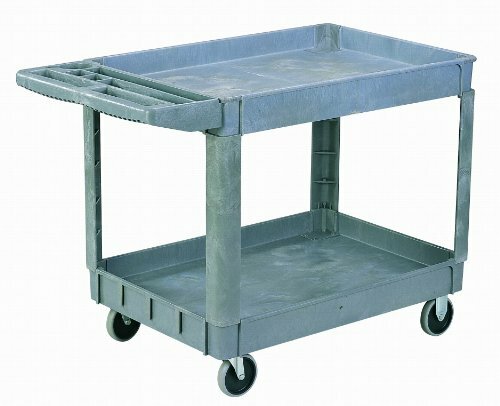 The KitchenEater KE1PC features a snap-and-lock, three-bolt system that mounts securely to the sink. 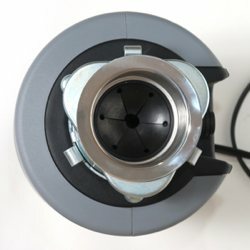 The disposer attaches easily to the mount with a simple quarter turn making installation easy. 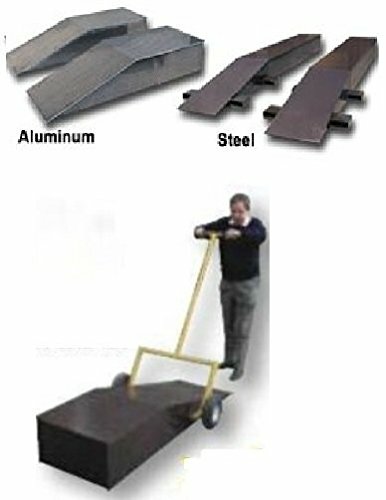 In addition to easy-to-follow assembly instructions, you can also access a toll-free help line for answers to any questions. 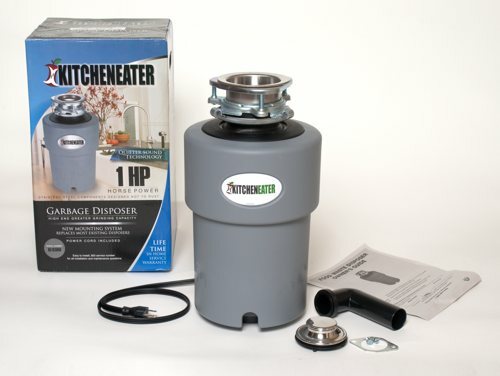 KitchenEater disposers feature a sound barrier and insulation surrounding the grind chamber, making them quieter than most food waste disposers. 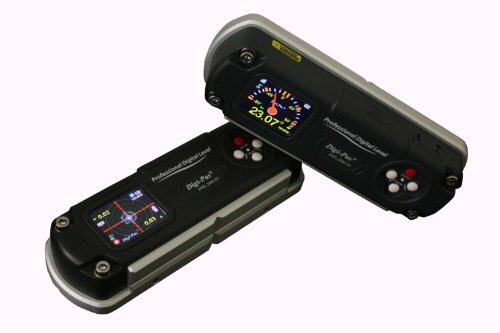 The mounting system and the drain elbow are designed not to vibrate. The high-end KitchenEater KE1PC disposer is outfitted with an exclusive Micro Blade for greater grinding capacity. 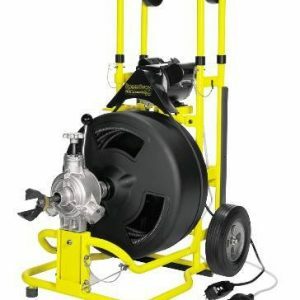 All grinding components are constructed of rust-resistant solid stainless steel, and a high torque motor enables more efficient grinding that prevents jamming. This 1-horsepower disposer is backed by a lifetime in-home warranty.